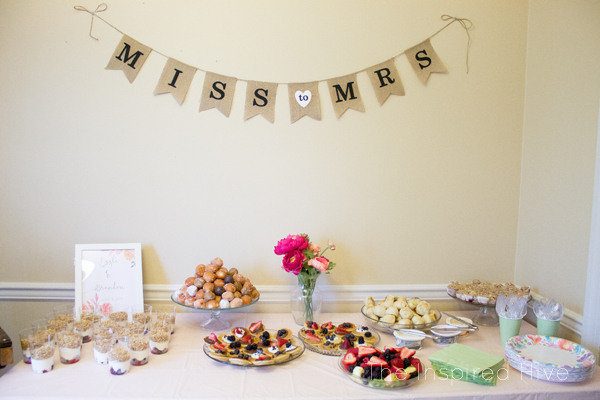 With the wedding right around the corner, we held her bridal shower last weekend. 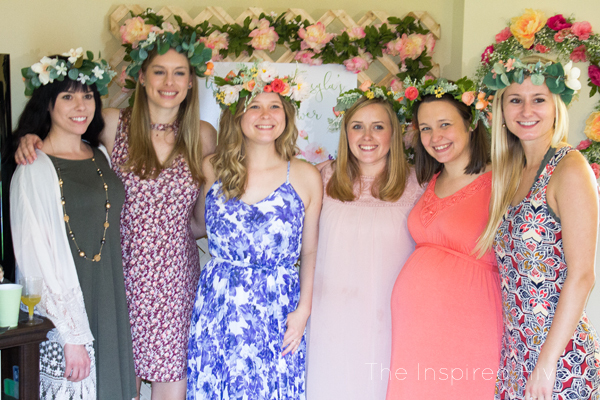 The other bridesmaids and I had so much fun planning! The weather crushed our dreams a little bit, but it ended up being absolutely beautiful despite the rain, and my sister had an amazing day! 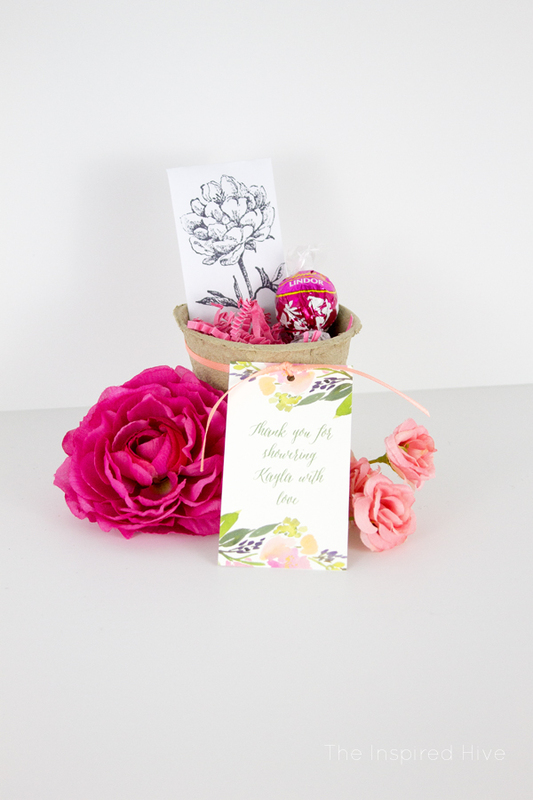 Big thank you to Minted for providing product for this post! I always picture my sister as kind of a whimsical person, so from the get go, I had a whimsical, floral, garden theme in mind. 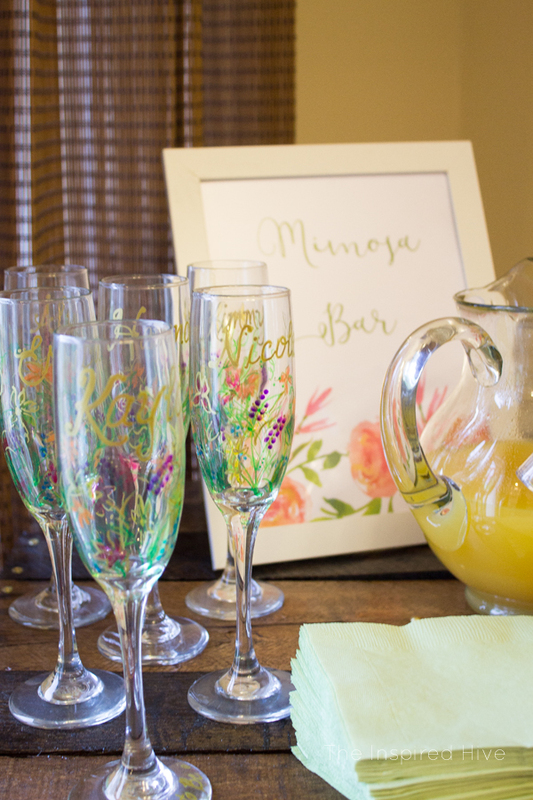 I also wanted to do it brunch style with a mimosa bar! Fun! 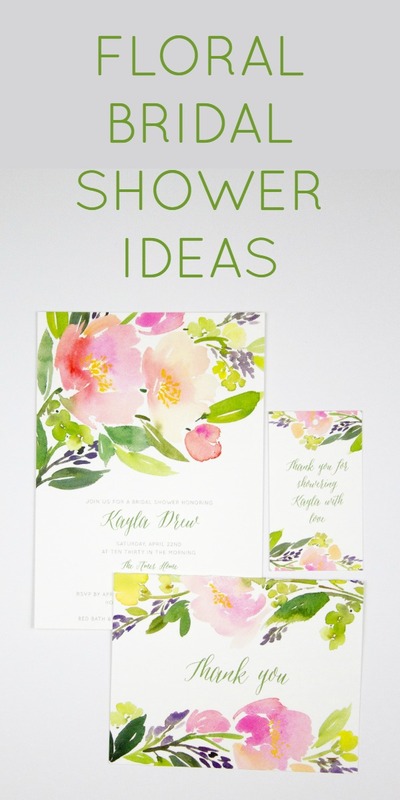 On my search to narrow down exact colors and styles, I stumbled upon these absolutely stunning watercolor floral invitations from Minted. 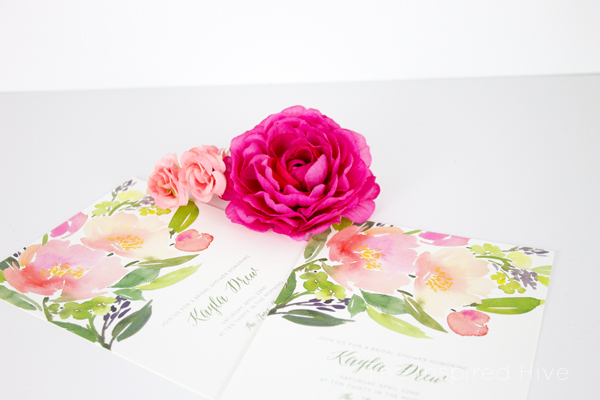 (If you're not familiar with Minted, they carry gorgeous stationary and artwork designed by individual artists. It's the perfect place for wedding invitations, holiday cards, home decor, and any other artsy needs you have!). 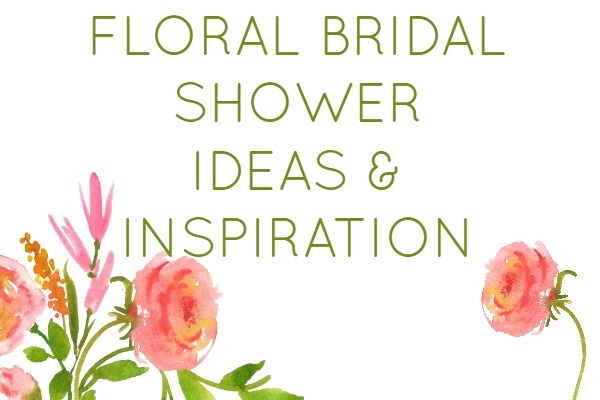 I absolutely loved the design and the colors, so I let it inspire the entire shower decor palette. 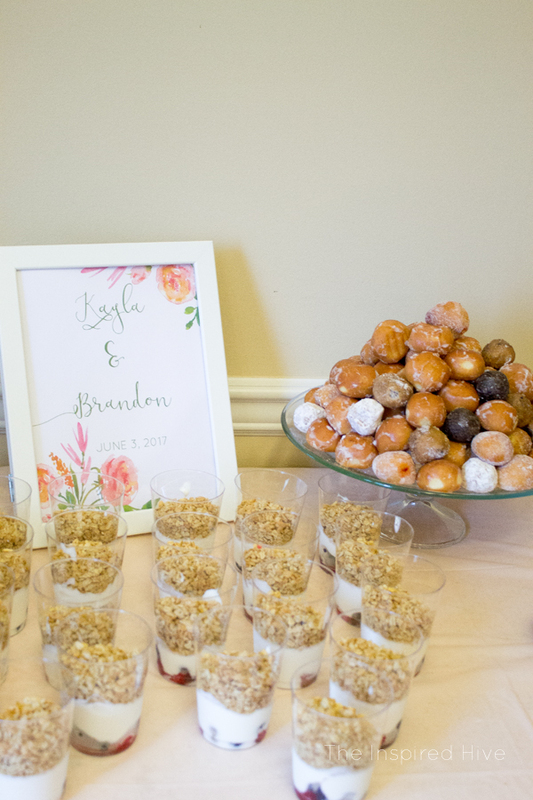 We decided to use lots of pinks and greens with a few pops of peach and purple. We incorporated lots of faux flowers and greenery as well. We hoped for beautiful weather and booked a big white event tent for the day! 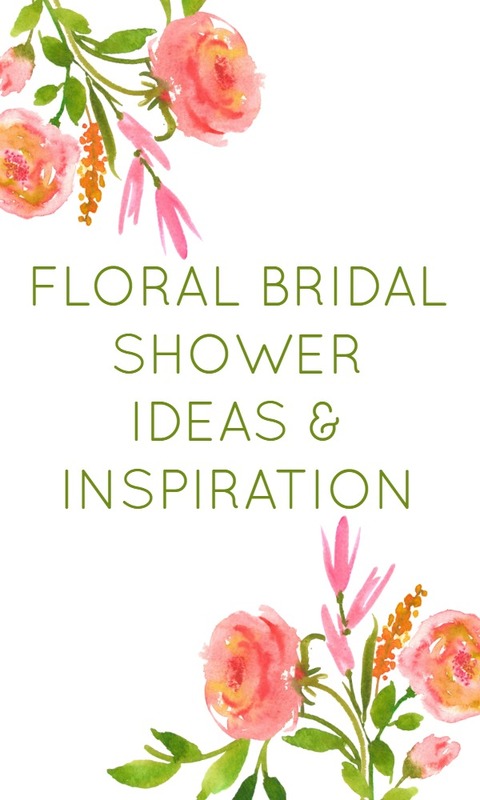 Once I received the matching invitations, thank you cards, and party favor tags, I was even more impressed by not only the beauty, but also the quality of the stationary. They really were stunning. 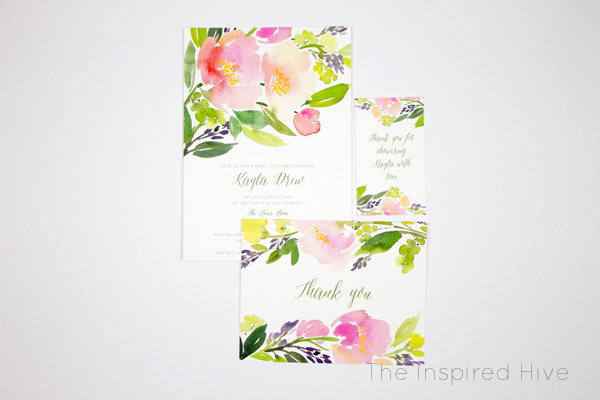 Minted also offers free envelope addressing, which was such a gorgeous additional touch to the already beautiful invitations! I wish I had thought to address one to myself so I could share the envelope with you, but you can see an example in the invitation listing. 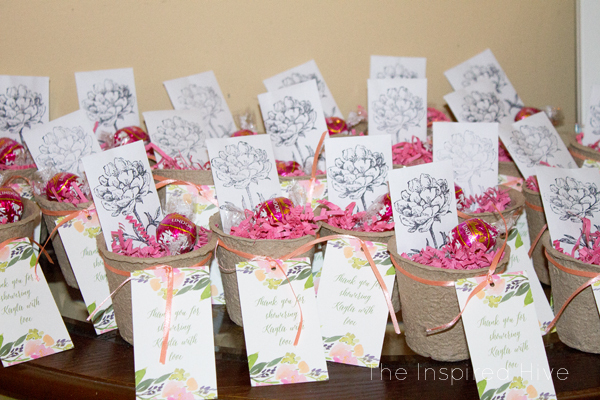 I used the beautiful favor tags to create these cute wildflower seed packet party favors. Get the tutorial here! 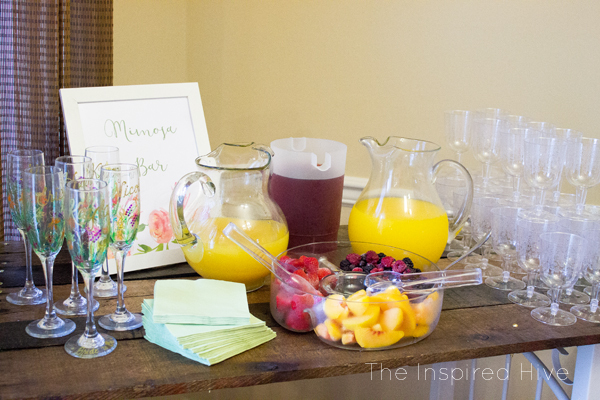 For the mimosa bar, we provided orange juice, cranberry juice, pineapple juice, and some frozen fruit. And of course, plenty of champagne! We found some cute plastic floral wine glasses at the Dollar Store that were perfect for guests! 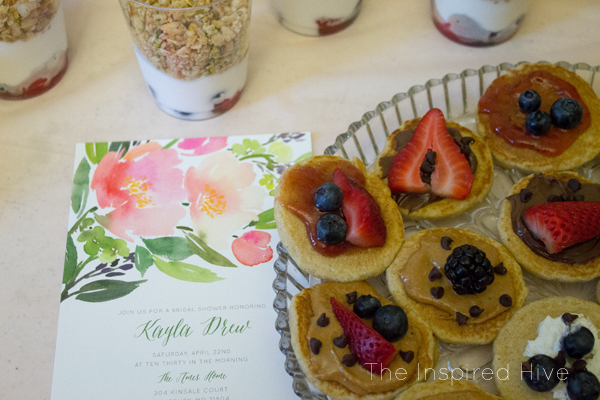 For our brunch foods, we came up with as many mini, bite sized ideas as we could! 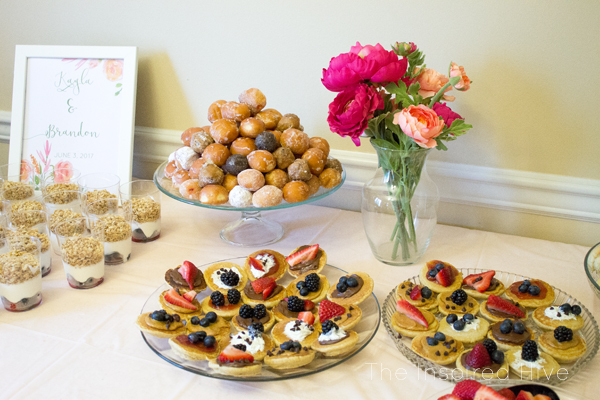 We made mini yogurt parfaits in individual cups, mini pancakes, mini bagels, mini quiches, and mini muffins, to name a few. Isn't mini just so cute and fun?!?! The mini pancakes turned out to be one of my absolute faves. Delicious and pretty! 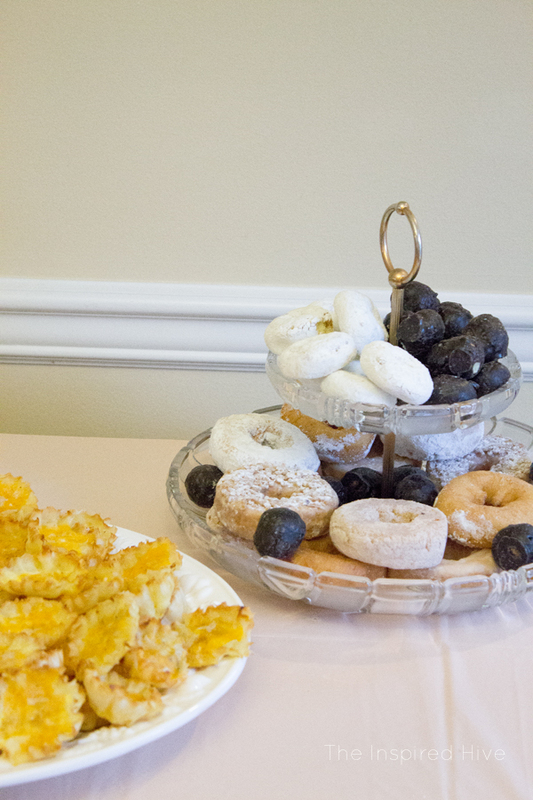 We served everything on pretty platters and cake plates. 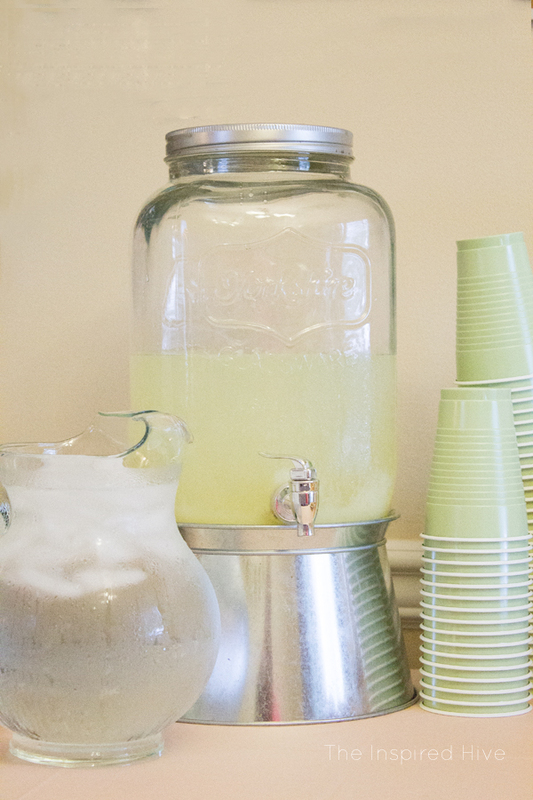 Lemonade for those who didn't want mimosas! 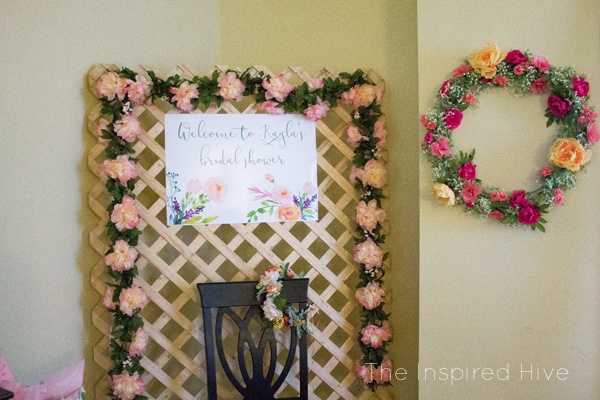 For the bride's seat of honor, we used a garden lattice as a backdrop. 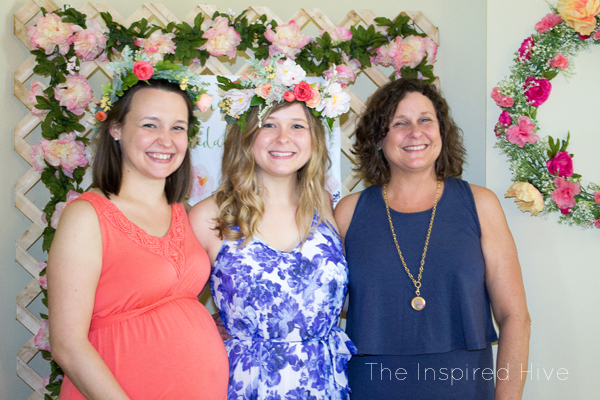 I hung a floral garland from it and had a pretty floral sign printed. That floral wreath to the right was actually intended to be a floral chandelier I made for the tent, buttttt when it rains, why not repurpose things?! 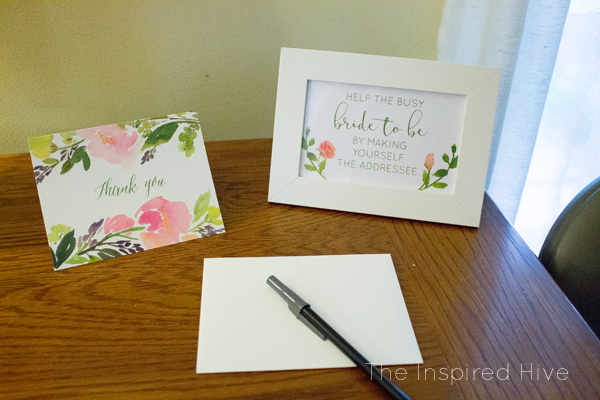 I loved the idea of letting guests address envelopes to themselves for thank you cards to make things a little easier for the bride, so we set up a station just for that! Two of the bridesmaids made floral crowns for my sister and the bridal party to wear. Aren't they beautiful?? And here's my sister and I with our momma! It was such a fun day honoring such a beautiful couple! I can't wait to celebrate the lovebirds even more in a few weeks!! !